The photo came in a letter that my Aunt Joan received from her cousin Gladys in the late 1990s. Joan then gave it to me when I visited her in May 2014. Gladys was the granddaughter of Julia (1872-1956), who married François (1859-1949) in Chapeau in June 1895. Left to right: Julia holding Victor (b. 1901), Albertine (b. 1897), François holding Richard (b. 1900), and Mae (b. 1895). Young Albertine (4½ years old in the picture) would later be my father Maurice’s godmother at his baptism in 1927. I’ve written about her and her sister Cora (not yet born when the photo was taken) in Sibling Saturday: Albertine and Cora Gagnon. 1. 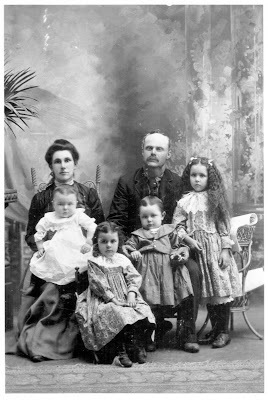 Gagnon family photograph, 1902; privately held by Yvonne (Belair) Demoskoff [ADDRESS FOR PRIVATE USE,] Hope, British Columbia, 2016. Gladys (Holden) Santry sent the photograph of her maternal grandmother and her family in a letter to her second cousin Joan (Belair) Laneville between 1996 and 2002. (Gladys dated and identified the individuals by name and age on the back of the photo.) Joan then gave the letter and photograph to her niece Yvonne when she visited her aunt’s home in May 2014.